"ARIMA (Quantitative Risk and Asset Management) is a very intensive master`s programme, which is just the thing for number-crunchers interested in finance, mathematics and statistics. The degree programme offers comprehensive quantitative know-how in asset and risk management, winning you over with practice-oriented applications. Since the studies are quite internationally-oriented, there are numerous possibilities for a successful career in finance and insurance." This internationally-focussed master's degree programme is run in English. Graduates qualify with a Double Degree from the University of Applied Sciences BFI Vienna and one of its partner universities: University of Bologna (Italy), University of Economics (Katowice, Poland) and Alexandru Ioan Cuza University (Iași, Romania). 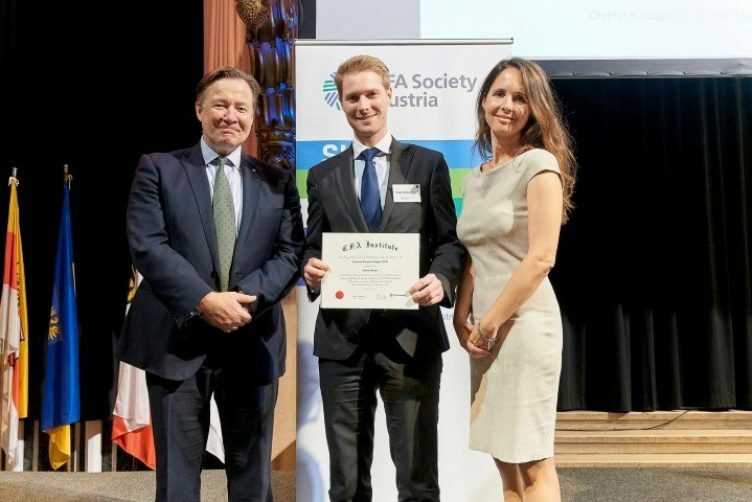 The master programme Quantitative Asset and Risk Management has strong ties to the CFA Society Austria and is submitting every year the best master theses to the CFA Austria Prize. Graduates of the master’s programme in Quantitative Asset and Risk Management (ARIMA) are now awarded the SAS Joint Certificate. ARIMA is the only programme in Austria, and one of only two universities in Germany, Switzerland and Austria (German-speaking countries), offering this qualification. The condition for this was the use of SAS software in the classrooms. We have a new research partner: FENION. Fenion specializes in the delivery of high-quality fund data in all common formats. Our long-standing customers include banks, insurance companies, asset managers, as well as trusts and companies in the public sector. In the context of an Innovationsscheck, sponsored by the FFG (Forschungsförderungsgesellschaft), the study program will conduct joint research with Fenion in the field of regulatory reporting for pension funds. Written application, MC test, structured interview. For preparation, we recommend our scripts. There are no external courses required. Obligatory in the second academic year, in blocked form (e.g. two weeks) at one of the partner universities. Completion of a social studies/business/natural science/ law/ technical degree (in Austria or equivalent degree abroad) with documented qualifications in economic sciences (at least 9 ECTS) and mathematics or statistics (at least 6 ECTS). For applicants having too few ECTS in mathematics and statistics the UAS BFI Vienna offers a bridging course with 3 ECTS. This course is offered free of charge. Passion for Finance: Quantitative Asset and Risk Management introduces itself.